The giant flightless ostrich of South Africa had a profound effect on the Karoo over centuries. The Karoo’s clean air heals the body and its space unfolds mind and spirit in unexpected ways. Meeting up with a monitor lizard on a Karoo farm. A Karoo sheep farmer may have stumbled across a revolutionary way of keeping his sheep more or less safe from jackals – by using caracals. In the Karoo, whether you’re the Dwarsvlei knitting circle, a church group or a book club, you may have the privilege of meeting high-up corporates who want to frack the shale gas out from under your feet. You may also learn more than you expected about a certain swimming pool. In the grassy Karoo of the Eastern Cape, you’re starting to see patterned Nguni cows grazing where before it was just sheep, sheep, sheep. Pied crow numbers are rising in the Karoo, causing problems for conservation and agriculture. 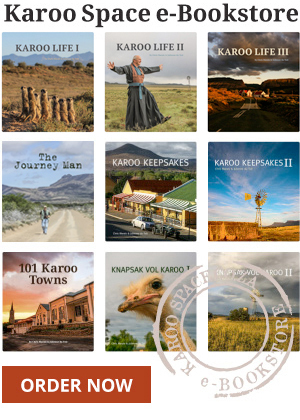 The Karoo Parliament, with the theme ‘Sharing our Successes’, will take place in Philipstown during October 2013. Now you can guarantee that your Karoo lamb really does come from the Karoo.